At just $80, the Ghostek soDrop 2 Premium Over-Ear Bluetooth Headphones are among the best values we’ve come across. They offer sound quality and battery life that rivals the Beats Solo3 over-ear headphones, but that model retails for $300. Ghostek’s popular headphones dropped down to a price that matched their all-time low over the Black Friday shopping period, and we have good news for you if you missed that sale: it’s still happening right now. 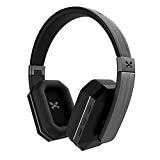 These killer headphones cost just $59.95 if you grab a pair today, and they make a perfect gift for anyone on your list (or for yourself, of course).